463 pages | 231 B/W Illus. In-situ burning is recognized as a viable alternative for cleaning up oil spills on land and water. It can rapidly reduce the volume of spilled oil and eliminate the need to collect, store, transport, and dispose of recovered oil, and can also shorten the response time to a spill, thus reducing the chances that the spill will spread on the water surface or further into land. 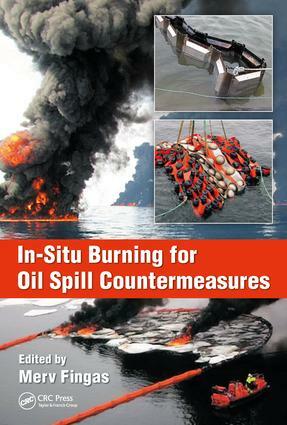 This book will serve as a comprehensive reference for all aspects of in-situ burning of oil spills and include the scientific aspects of the burning process and the related effects, as well as practical information about the procedures to be followed and equipment required for carrying out an in-situ burn. Serves as a complete source of information on in-situ burning as well as practical guide on how to implement the procedures. Explains procedures for burning in different situations, including on water, land, and ice. Provides information on worker health and safety precautions during burning. Covers several different types of emissions, their environmental fate, and how to monitor them. Includes numerous illustrative case studies. Summary of in-situ burning of oil spills. The Physics and Chemistry of Burning. Overview of practical burning and application. Emissions. Assessment of feasibility of burning. Burning on water – Procedures. Burning on land and wetlands. Burning oiled marshes. Burning in or on ice. Equipment - selection, deployment, and operation. Monitoring, sampling, and analytical equipment. Final recovery of residue. Possible spill situations. Post-burn actions. Health and safety precautions during burning. Worker health and safety precautions. Dr. Merv Fingas is a scientist focussing on oil spills. He was Chief of the Emergencies Science Division of Environment Canada for over 30 years and is currently working privately in Western Canada. Mr. Fingas has a PhD in environmental physics from McGill University, and three masters degrees (chemistry, business, and mathematics), all from University of Ottawa. His specialities include: in-situ burning, spill dynamics and behaviour, spill treating agent studies, remote sensing and detection. He has over 900 papers and publications in the field. He has prepared nine books on spill topics in recent years. He has prepared a manual on insitu burning in 2000 and since has prepared book chapters on the same topic. Dr. Fingas has been an editor of the Journal of Hazardous Materials for six years. He has served on two committees on the National Academy of Sciences of the United States on oil spills including the recent ‘Oil in the Sea.’ He is chairman of several ASTM and inter-governmental committees on spill matters, including in-situ burning. He is on the international committee of IMO looking at the incorporation of a burn manual for United Nations. He has worked co-operatively with up to 25 agencies on in-situ burning projects including the U.S. Coast Guard, U.S. EPA, U.S. Minerals Management Service, Several Oil Companies, Canadian Coast Guard, CEDRE in France, etc. Importantly, he was the founding chairman of the ASTM sub-committee on in-situ burning, a position he holds today.